Obesity has reached epidemic proportions throughout the world. Childhood obesity is also rising fast. Obesity in children means a body weight more than 20% of the ideal weight, or body fat percentage of more than 25% in boys and 32% in girls. Childhood obesity leads to many health problems at a very early stage in life. It increases the child's risk of suffering from health conditions like diabetes, high blood pressure, cardiovascular diseases, cancer, sleep apnea, etc. It also increases the child's risk of suffering from a painful digestive disease called Gastro Esophageal Reflux Disease (GERD). GERD or acid reflux disease is a condition in which the contents of the stomach, including gastric juices which are acidic in nature, flow up to the food pipe causing damage to the inner lining of the food pipe (esophagus). The symptoms for GERD in children are repeated vomiting, cough, frequent burping, nausea, bad breath that smells acidic and some other respiratory problems like asthma, bronchitis, sinusitis, ear infections, etc. If the stomach contents are inhaled, it may lead to serious conditions like pneumonia. Frequent episodes of acid reflux can also cause esophageal cancer. The symptoms of GERD in children can be prevented to a certain extent by following these practices - give small frequent meals; preferably keep their dinner light and it should be finished 2 hours before bed time; avoid high fat meals or any deep fried and spicy foods as it aggravates acidity; don't let them play immediately after their meals as it may increase the regurgitation of food; their sitting postures need to be corrected. 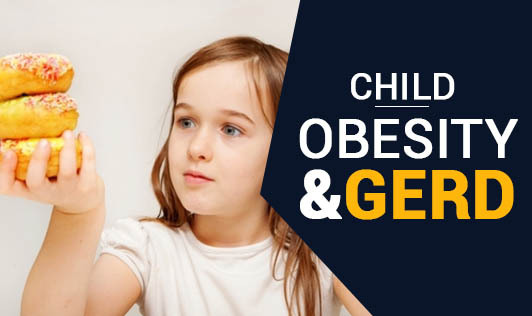 Parents have to keep a check on their child's eating habits and physical activity so that obesity can be avoided and conditions like GERD will be prevented. Good nutrition and a healthy lifestyle are of utmost importance for keeping your child away from obesity and all the related health problems.